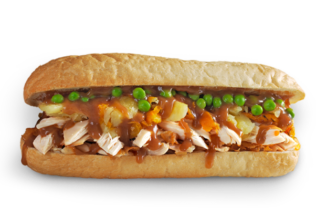 The roll contains everything you would normally find in a roast dinner including roast chicken, baked potato, pumpkin, peas and gravy. Red Rooster is also now selling chicken rolls with hot chips and gravy in the roll after noticing customers have been creating this combination by themselves for years. Both rolls are priced at AUD $8.49 each or AUD $10.00 with a can of drink. The new menu items come at a time of change for Red Rooster and its parent company, the newly renamed Craveable Brands (formerly called Quick Service Restaurant Holdings). In March 2017, Red Rooster announced it will be opening a series of new city restaurants called “Reggies”, aiming to create a more contemporary version of Red Rooster. In May 2017, parent company Quick Service Restaurant Holdings announced its name change to Craveable Brands and made new appointments to its board of directors. The largest commercial kitchen in the southern hemisphere has opened at Melbourne Airport.